Making real estate pictures can be a lot of fun and even profitable. The thing is, you can easily spend way too much shooting and finishing them to make it worth your time or worth the realtor’s time to hire you. Or maybe you’re a realtor and you need to make these kinds of pictures for your client. Either way, using HDR is the fastest way to get great looking real estate photos. Here are ten tips to shoot them fast and finish them fast so you don’t turn real estate photography into a money pit. You need to use a tripod for two reasons. First, you’ll be using a very slow shutter speed in many instances and you won’t be able to hand-hold the camera. Aurora HDR does a great job of aligning your pictures, but it can’t do anything about you making blurry pictures. Second, using a tripod will allow you to carefully compose your pictures. You’ll be able to easily level the camera so that it is not shooting upward or downward so that the walls are all vertical and not tilting. Nothing looks more like a snapshot than pictures with the corners all tilting. A tripod will also allow to intentionally include important surfaces and views that without shooting too many pictures, which will save you lots of time editing. Interior lights don’t match the daylight outside. Daylight shining in a window may look great if it’s directly from the sun, but if all you can see out the window is the blue sky then the light shining into the room will be blue, too. And neither of those colors matches the light bulbs inside the house. Since you’re using HDR to finish your pictures, you can turn off the lights in the house and just let the window lights illuminate the room so that there is only one color of light to deal with and the picture will look more natural. You’ll sometimes leave accent lights on, but make sure they aren’t too bright. You’ll need the room lights to shoot at night, but notice the color of the bulbs. It’d be a worthwhile cost to spend $20 on a bunch of light bulbs for your kit so that you can replace those bulbs that are different from others. In order to get an accurate and comfortable color in each room, you’ll need to make a custom white balance. Check your manual (or Youtube) for how to do it with your specific camera model. A white balance target like the ColorChecker Passport Photo is a worthwhile investment, but a piece of white paper can work in a pinch. Different colors of wall paint and green grass outside will make the light in each room a different color. It’s a good idea to quickly make a custom white balance for each room. The green floor, blue walls, and exterior light could have been a white balance disaster. In your camera menu, find the control to turn on exposure bracketing. You may be able to make brackets of three pictures, five pictures, even as many as nine. Your camera will change the shutter speed for each picture to make it brighter or darker than the one before it. Because the dynamic range inside a house is so great, set your camera to record the greatest number of pictures and set them to record the greatest exposure apart. So, on my Lumix cameras, that means I shoot seven frames each one stop apart. You may need to add a few frames manually. Shoot the camera’s automatic bracket then go to the slowest shutter speed your camera used and make another frame or two slower to get light into the very darkest parts of your picture. Change it so that it shoots from darkest to lightest, like this: -/ 0/+. The reason is that when you view them on the computer you’ll see bands of dark to light representing each bracket and it makes it very easy to see each bracket. Now that you’ve photographed the house, put your pictures onto your computer in one parent folder. Then put the brackets that you want to finish into a subfolder. That is, separate all the white balance shots and all the shots you don’t want to finish. This will make it much easier to finish the pictures in a batch and save you hours of time. Sort them based on the lighting in the picture–sunny rooms in one folder, blue sky rooms in another and interior rooms without windows in another folder. Find one of your favorites and open the whole bracket in Aurora HDR. I prefer to launch it directly into Aurora because Aurora’s .mpaur2 files can be re-opened and tweaked from where I left off, whereas a .tif file from Lightroom is baked once your hit Apply and can’t be altered in Aurora without starting over from the beginning. Start with a Look and customize it. Save your finished settings as a new Look. Once you get your photo looking great, save the settings as a new Look. Saving your Looks will allow you to batch process many brackets at once. Again, this is an advantage of launching directly in Aurora because if you forget to save the Look, you can just open the file again and save it; but if you launch from Lightroom and saved the .tif file you can’t re-open it and save the Look. I’ve done this many times in Aurora and I’m still amazed at how easy it is. Launch Aurora and choose Batch Processing. Click Browse and navigate to the folder where your brackets are or drag the folder into the window. These should be the pictures that are similar to the one you already finished and saved a Look for. Click the button for HDR Brackets (not Single Images). This may take a minute or two to process because it is sorting each of your brackets into the right order and it’ll give you a preview of the bracket sets when it’s done. Click Continue when it’s finished collating. Once that batch is finished, open a bracket from one of your other sets of rooms and see if your Look is the right setting for that room, too. If not, make the tweaks it needs to look good and save a new look. Now batch process that whole set of rooms with that new Look. Batch Processing is the fastest way to get all the rooms looking great. Now that you’ve run your Looks on the rooms as batches, go through and double check that each room looks its best. Sometimes the Look you used wasn’t the right choice and you should run it again. Other times you may have bumped your tripod during a bracket and it needs to have Ghost Reduction applied. Find these anomalies and run them individually through Aurora. 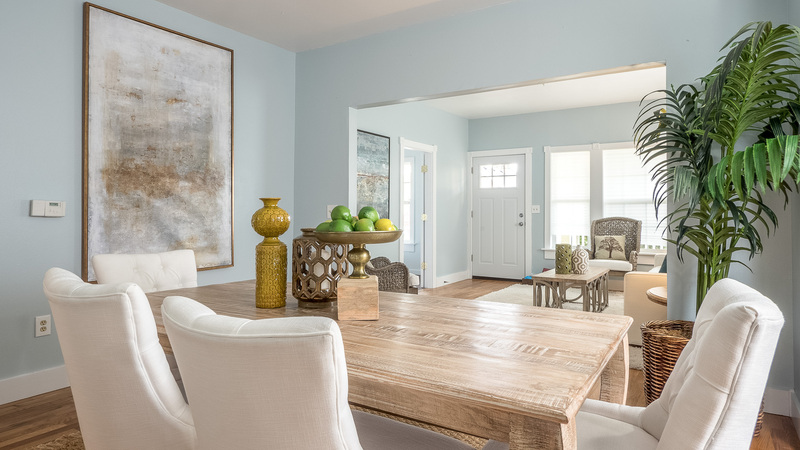 Use these tips to make contemplative pictures that show off the house at its best and get them done swiftly with Aurora HDR 2019 and you’re clients will be pleased and their houses will sell more quickly and you’ll get hired more frequently. Real estate photography can be a good business if you can get your photos turned around quickly and Aurora HDR 2019 is the best tool to help you do that. Here’s a link to save on Aurora HDR 2019 and get training videos, free looks, and LUTs as well!